No problem - the Ultima supercar is probably one of the easiest component cars to self assemble and for 75% of our customers this is their first ever build. The Ultima has been designed, developed and tested over a period of years to be assembled in a single garage by a complete novice. All the parts are included in the kit, down to the last washer. Expert guidance is available at every stage and a build advice line is linked directly to the factory. As far as our team is concerned there is no such thing as a daft question. Prior to delivery to the customer the factory carries out work on any part that requires workshop facilities to assemble it. For instance, items like the uprights are supplied with all the bearings pressed in and hubs completely assembled ready to simply bolt to the wishbones. All the aluminium panels are cut to size and all the folds in the panels are pre-formed by the factory. In short this is a complete self-assembly supercar. Simple hand tools that can be purchased for under GBP200 from any motor factors are all that you require to build one of our cars. Should you have any concerns over items like fitting the bodywork then the factory can carry this operation out for you. We are very conscious that we are selling a leisure pursuit and therefore will do everything in our power to make your supercar build a pleasurable experience resulting in a car to be proud of. If you still have any doubts about how straightforward it is to assemble the Ultima or are interested in exploring a potential purchase further please do not hesitate to phone our office on 01455 631366 and we will be delighted to arrange a mutually convenient date for a visit to the factory. Is there a build manual? The online build manual content provides step by step build guidance instructions, it can only be accessed by Ultima chassis owners and deposit holders via secure online access. Is the Ultima a road legal car? Yes, the Ultima has been successfully road registered in over 40 different countries to date. How suitable is the Ultima for road use? Charging points for sat nav phone etc. How is the body finished? The Ultima bodywork is supplied in an immaculate market-leading gel coat finish which does not require painting. Gel coat is thicker than any paint finish and is more resistant to stone chips. It is only possible to achieve a gel coat of this mirror finish due to the sensational quality of the Ultima body moulds which were painstakingly developed. This saves our customers the need for an expensive and time consuming bodywork paint finish being applied at a paint shop. What gel coat body colours are available? There is an Ultima bodywork colour configurator which conveys the body colour choices. How long will it take me to build my Ultima? Our average customer takes around 350 hours. Take your time and savour the fantastic build process. Does Ultima have any dealers? Our company policy is to deal directly with our customers and so all Ultima vehicles are supplied directly from the factory in Hinckley UK to the customer. Which engine should I use in my Ultima? The factory has designed the Ultima EVO to accept the LS Chevrolet V8 engine ranging from 300bhp to over 1000bhp. The factory does not recommend fitting alternative engines. Who do Ultima recommend to supply an engine? Tuned engine packages are also available from American Speed Inc. Illinois, USA (www.amerspeed.com). Which gearbox do I use? The Ultima has been designed to accept the Porsche 996 six speed manual transaxles. Apart from changing the breather location no other modifications are recommended. How strong are the transaxles? The Porsche transaxle is superbly engineered and has an exceptional weight/strength ratio. The Porsche transaxle fitted to the lightweight Ultima supercar has been used successfully with engines over 1000bhp. Where is the gear stick situated? The Ultima gear change is centrally mounted, situated close to the steering wheel with a superb billet 6-speed manual H-pattern quick shifter. Is there a PDK option? No, the Ultima is a real driver’s car and therefore is only available with a six speed manual shift gearbox and a clutch pedal. The PDK system seen on many cars nowadays is not in keeping with the ethos of an Ultima which was primarily designed to maximize driver engagement and to provide an old school Le Mans inspired thrill like no other road going sports car in the world. We aren’t interested in the dulled down mass market driving experience like most other sports car manufacturers are and therefore the Ultima will always be a manual shift supercar to cater for those true driving enthusiasts who appreciate and indeed crave this philosophy. How much room is there in the cockpit for tall drivers? Drivers up to 6’ 10” have fitted in our standard Ultima seats with our extended pedal box option. Can the Ultima be LHD? Yes, over half the kits that Ultima produces are left hand drive. Does the Ultima have any luggage space? There are purpose made alloy sealed luggage containers either side of the cockpit. These are accessible from inside the car. There is additional space behind the seats and in the doors. Storage is also available behind the access panel under the front section. Trips abroad are no problem and neither is the weekly supermarket expedition. An Ultima supercar self assembly kit is generally ready for shipping within 22 weeks of the order being placed. What is the usual procedure for ordering an Ultima supercar self assembly kit? Simply email the factory at sales@ultimasports.co.uk to discuss the specification for your Ultima. The factory will then prepare a quotation listing the parts that will be required to assemble your new supercar. We ask for a 25% deposit to confirm your order. A second 25% instalment is due after 6 weeks when you firm up your options choices. The remaining 50% to be paid once the parts are packed and ready for shipping. During the period between placing your order and being ready for delivery we will keep you up to date with progress via e-mail, including jpeg images of the parts as they are prepared. How do I pay for my Ultima kit? The factory will e-mail the company bank details and you simply instruct your bank to transfer the funds to our bank account. Alternatively Ultima accepts all credit cards and payments via PayPal. Can I use different seats? Ultima has designed its own OE seats which maximise the cockpit space and headroom. Other after market seats will fit but may compromise the driving position and headroom. 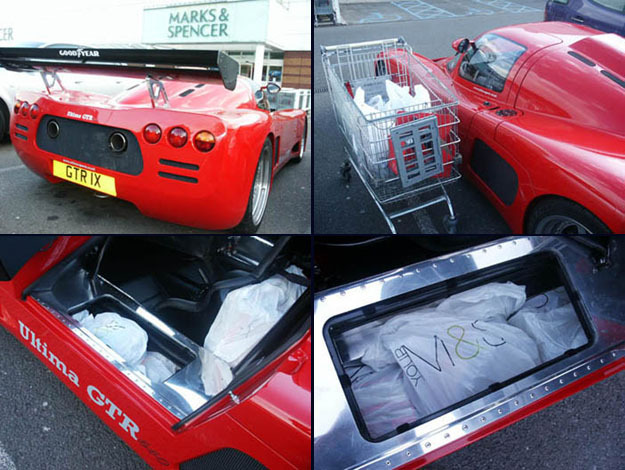 Yes the Ultima supercar is comprehensively designed to comply with the regulations. Do I need any specialist tools? An Ultima can be built using a very modest tool kit but can be made easier if a right angle drill is employed. Apart from the cost of a drill all the tools required to build an Ultima could be purchased for a budget of under £200. Why is there no rear window? The unique teardrop shape of the Ultima means that the door mounted mirrors give a wider field of view than on conventional cars without the blind spot caused by the rear screen pillar so no rear window is required. Is the rear wing essential? The car can be driven at high speeds quite safely without the rear wing so it is only needed to optimise down force and for 200+mph runs. Do the Company build turnkey cars? Ultima supercars can be factory built to special order. Can I fit my own wheels? Ultima manufactures its own flow formed and forged wheels to fit its cars and are the only type that the company recommends. Is there a weather strip around the doors? Yes the doors are 100% watertight. Yes – normal key operation. The Ultima supercar has road compliant suspension giving an excellent and enjoyable ride quality suitable for long distance touring. They also have fully adjustable shock absorbers and therefore the ride quality can easily be altered by changing the damper settings via an adjustment knob at the base of each damper in a matter of minutes- from comfortable road settings to track day settings. Can Ultima supply everything to build the kit? The factory can supply every part to build your kit down to the last nut, bolt and washer apart from the Chevrolet V8 engine. Will my Ultima travel over speed humps? The Ultima has been designed as a road going supercar so will therefore clear any speed-humps and other obstructions such as ferry ramps. Careful attention was made in the design process, with short front and rear bodywork overhangs being one of the key ingredients to ensure that the Ultima has adequate ground clearance for all public road situations. Why does the Ultima not need roll down windows? Simply because the doors open upwards unlike front hung doors on ordinary cars that are forced to have some form of opening access. Tolls and the like are simple to access in this way and more fun than boring windows. Another benefit of the Ultima gas assist door opening system is that they can be opened in tight parking spaces allowing driver and passenger access unlike cars with ordinary doors. Perhaps the most important reason for the 3/4 opening doors is that it allows for a huge 300mm crumple zone to the side of the driver and passenger offering superior protection over front hung doors. How much will my Ultima cost to build? You can build your own new Ultima supercar from our tailored self-assembly package of parts for around the same ballpark price as a mundane new BMW M3, depending on options selected. Turnkey Ultima cars can be factory built to special order. What is the fuel tank capacity and fuel consumption? The total fuel tank capacity is 78 litres. The lightweight Ultima supercar with a typical 500+bhp Chevrolet V8 fuel injected power plant will deliver a fuel consumption of around 28mpg on a longer cruise. Using repeated full throttle applications will considerably reduce this figure. How difficult is it to climb into or out of an Ultima? Easy due to the large overhead door openings once the correct technique is used. Two or three practices are all it takes. Feel free to ask the Ultima staff to demonstrate this to you at the next show or factory visit. Can the Ultima be driven on a daily basis? How safe is the Ultima? The Ultima is inherently safe due to the Le Mans inspired race car design and layout. The vertically opening doors allow for a huge 300mm crumple zone to the side of the driver and passenger offering superior protection. Driver and passenger sit well inside the car, much closer to the centreline to provide additional safety, compared to conventional sports cars that have the occupant’s bodies very close to the outside edge of the car. There are substantial built in triangulated crumple zones front and rear with a race proven chassis structure of market leading torsional rigidity. The Coupe comes with a heavy-duty six-point roll cage that serves to add chassis stiffness and provides some significant protection in the event of a roll-over or impact with another vehicle or obstacle. The Convertible also has a robust single hoop roll over bar design with forward bracing that is superior to most open top sports cars of this genre. The driver’s pedals are importantly located behind the centre line of the front wheels. Lots of further safety parameters have been incorporated into the Ultima design process such as the steering rack system being of a central shaft pick up location enabling a collapsible and none intrusive 45-degree steering column. Six-point seat belt harness fixing points are installed as standard to every chassis to add another level of safety above a conventional road car. The windscreen is triplex laminated glass with shatter proof polycarbonate side windows. All fuel lines are supplied in Teflon lined stainless steel hose. How do I get fresh air into the cockpit? The optional helicopter vents that are fitted in the side windows are very effective and ram fresh air into the cockpit at any speed. The flow can be directed by altering the angle of the vent. Opening them the other way round exits air from the cockpit. What is the temperature like in the cockpit? The air conditioning option is highly effective on extremely hot days and will keep the driver and passenger cool in any conditions. If the heater only option is chosen then air can be circulated around the cockpit using the blower with the heater set at cold. The helicopter vents are particularly effective for bringing cooling fresh air into the cockpit if desired. In cooler weather the heater does a great job.